My mother was looking for a drive and some dinner on Sunday night, and I knew, I just knew that barbecue was what she was looking for. So I tooled around on Urbanspoon, sampling the random wonders of their slot machine, trying to find something that would give her a worthwhile cause for mileage. 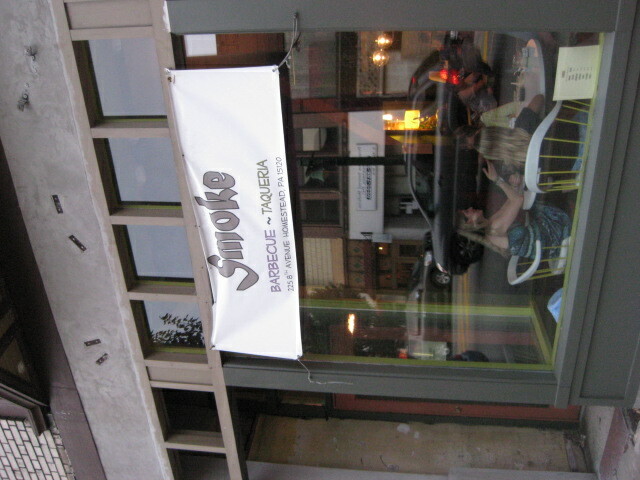 It turns out this city is certainly not lacking in quality barbecue. I settled on Selma’s Texas Barbecue for many reasons, but mostly because it looked charmingly small-scale and had a cheerful, friendly website that even touts a back story for the restaurant. As anyone who has read my Waffle House article will know, I’m a bit of sucker for tiny little cheap food joints with storied histories as well as tasty food. 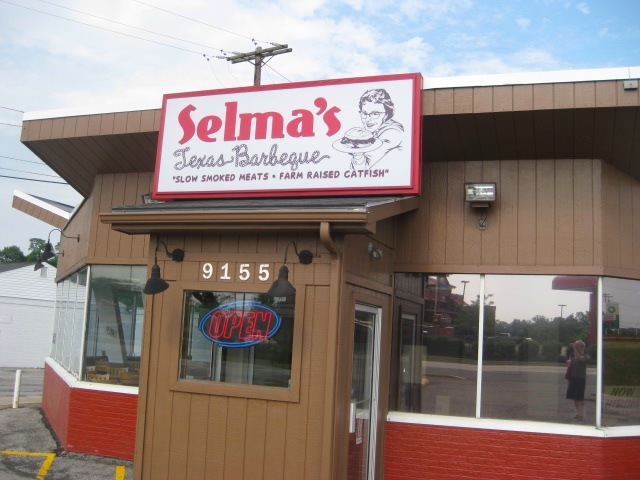 Selma’s history is focused on Selma herself, a native of Texas and Arkansas for whom the restaurant models its wholesomely unhealthy Southern cuisine. The food is inexpensive but prepared to very particular specifications. 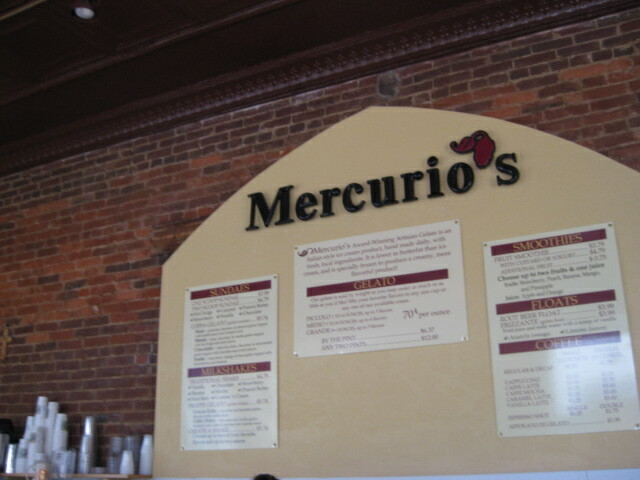 The catfish is farm-raised, the meat slow cooked all day, the sauces mixed in-house. Even the baked goods are homemade, ensuring that patrons can get a fix of Coca-Cola cake and banana pudding alongside their ribs and cornbread. Western Pennsylvania may not have the barbecue pedigree of the South, but it’s got a hankering for the cuisine all the same. Our neighbors in West Virginia know what they’re doing around a grill pit, and many of them have been kind of enough to spread the wealth into this region. Besides, the slow cooking ways of the Pennsylvania Dutch are not unlike the slow cooking ways of the Deep South. We share an affinity for pork and starches and meals that stretch from late afternoons to nightfall. What we share, like many food cultures, is a desire to sit around all night and converse over full plates of delicious home cooked foods. Selma’s is very, very low key. You walk in, order your food, grab your cup and fill it up yourself, and take a seat. 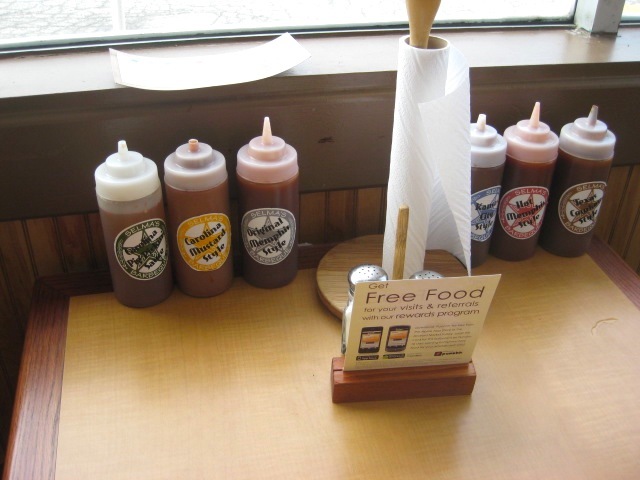 Someone will eventually bring your food, but while you’re waiting, feel free to educate yourself on the fine sauces offered on every tabletop in the small restaurant. Selma’s even gives you a handy guide to the sauces, including a basic description of flavor and recommendations on what to use each sauce on. Kind of them, certainly, but I had no intention of only trying certain sauces on certain things. If there wasn’t a palate of sauces left on my plate at meal’s end, I had failed some kind of test. Sometimes, you run into the limits of reviewing. Some places just seem to resist a direct assessment. For example, it seems kind of silly to “review” D’s Six Pax & Dogs. What is there really to say? 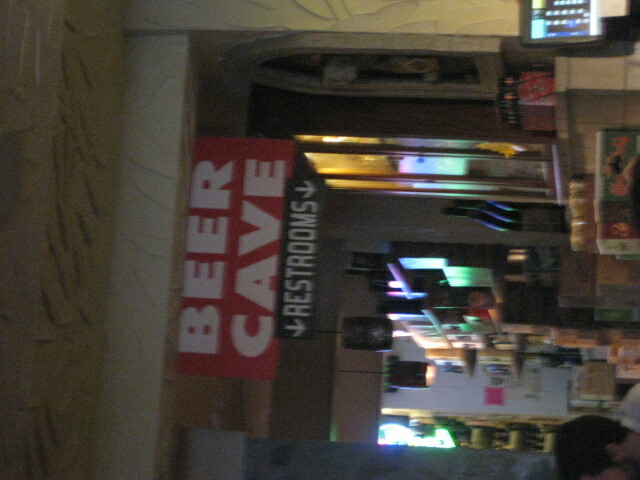 There’s a beer cave. A giant hall of beers, each one available to you, the customer, at a reasonable charge. 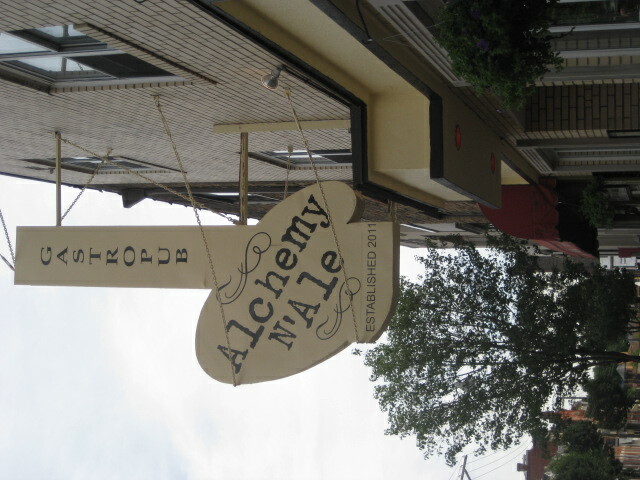 Where some restaurants offer a one-page list of drafts, followed by a one-page list of bottled beverages, D’s offers you the world of beer. 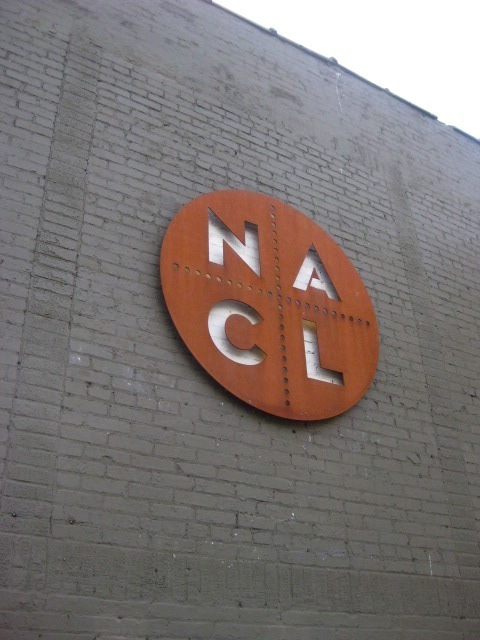 You can stick with the two-page draft list, including such highlights as the Southern Tier Gemini, the Great Lakes Blackout Stout, and even the non-alcoholic 1919 Draft Root Beer. Or you can wander about in the beer cave, running your hands up and down boxes, bottles, your life infinitely more complicated than it needed to be, but it’s beer and you’re here and what the hell, you’ve got the choice make! 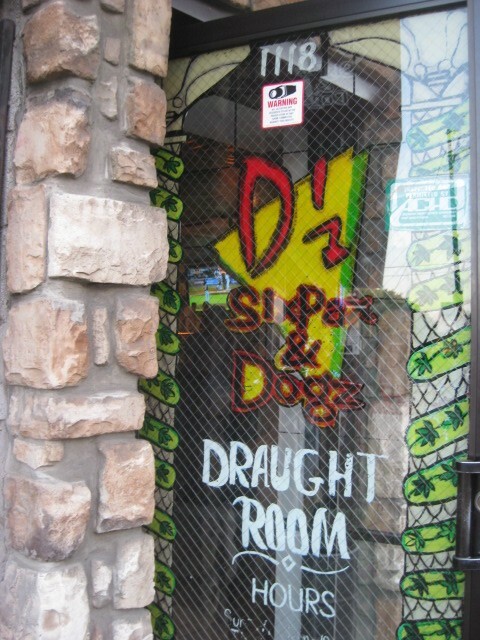 D’s also generously offers a great deal to go with your beer. It’s bar food, but reliably tasty. 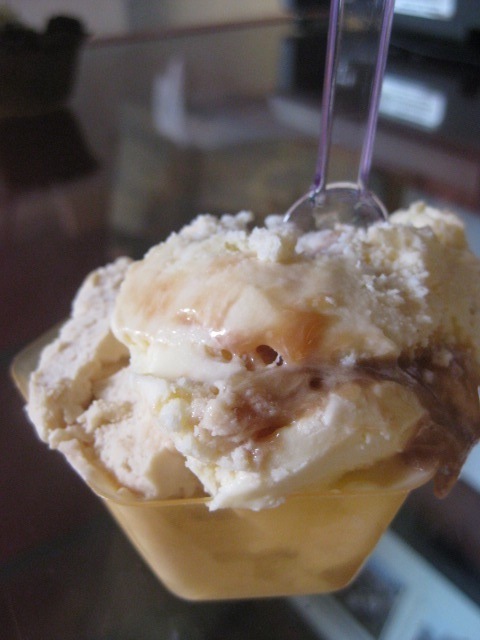 The kind of food that is regrettable for caloric intake alone, but enjoyable for any number of reasons. Affordable enough to pile it on, big enough to share, if you’re drinking and not eating at D’s, there’s obviously something wrong. 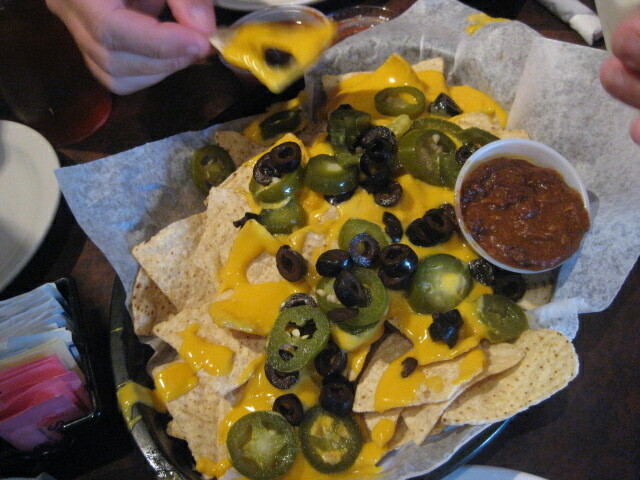 The nachos pictured above were shared by four people, which it more than accommodated. We demolished it, wiping up remnants of gooey nacho cheese with scraps of tortilla chips. The taste was akin to snack bar nachos but with better cheese and fresh chips, a taste anyone who grew up going to their neighborhood pool and roller skate rink can get behind. The top two are veggie dogs, the bottom two are all-beef hot dogs. They’re served on simple but fresh sesame buns and topped within an inch of your life. 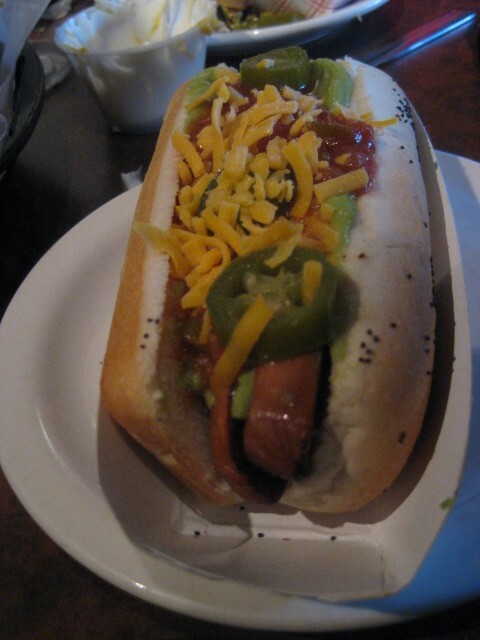 Hot dogs aren’t much for sharing, so I can really only discuss my veggie Chihuahua dog, with its sharp cheddar, salsa, and piles of jalapeno. The real delight here, and something I honestly never would have thought to put on a dog, was gooey, creamy avocado. 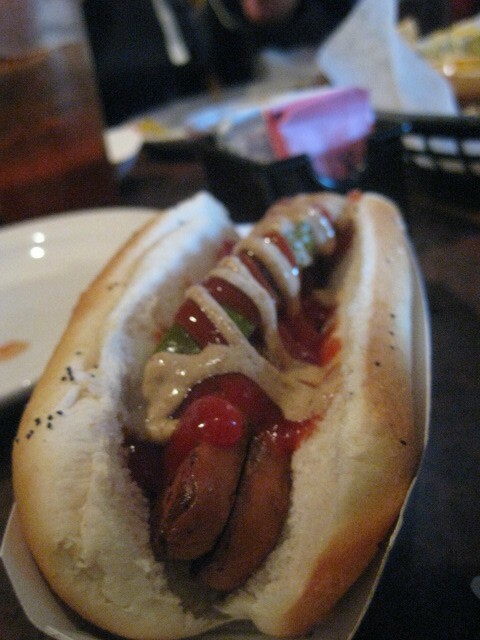 It soothed out the greater heat of the hot dog without detracting from any of the flavors. 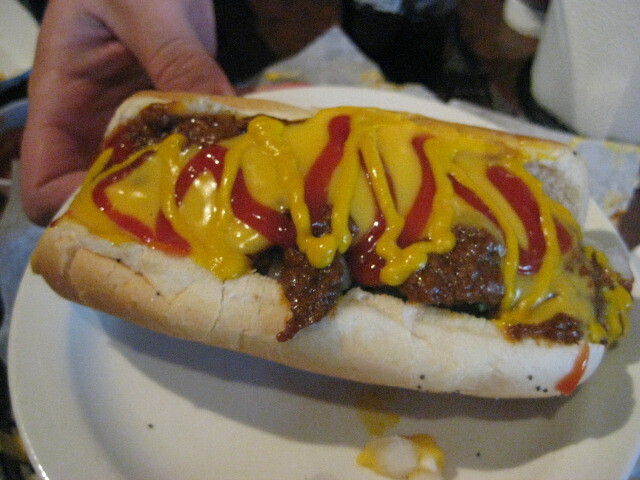 The veggie dog itself was a little crunchy, a little chewy, a good meaty non-meaty hot dog. We shared nachos. 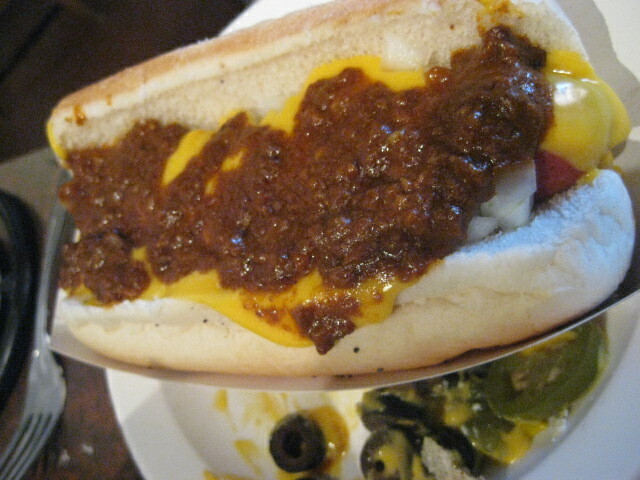 We each ate a mountainous hot dog. Then we shared a pizza. Again, like the nachos, the pizza is like a really good generic snack bar pie, the biggest difference being the quality of the crust. 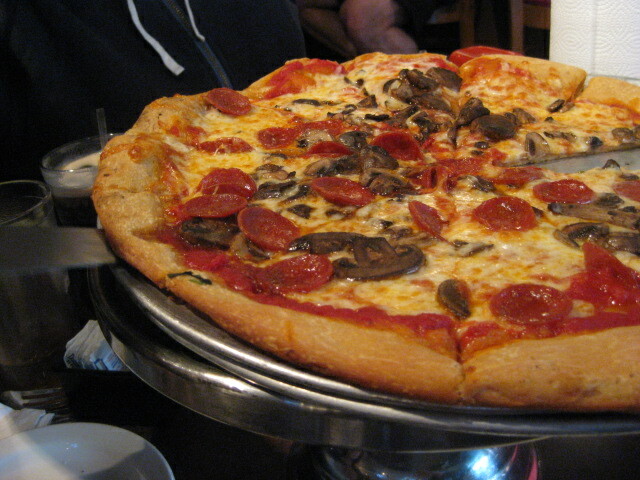 The crisp crust was denser than it appeared to be and sustained the weight of sauce, cheese, and the significant amount of pepperoni and mushrooms. The sauce is decent (a little sweet, mostly inconspicuous), but cheese is applied in just the right amount, and the toppings, while generous in number, do not crowd out the basic factors of the pie. It’s salty and greasy, but it’s pizza, and it’s a perfect counterpart to its hot dog and nacho brethren. It’s hard to review a place like D’s because everything works so well within its own environment. It’s not gourmet, and it’s not supposed to be. You don’t go to D’s to eat a life changing meal, unless your plan to change your life includes a triple bypass. 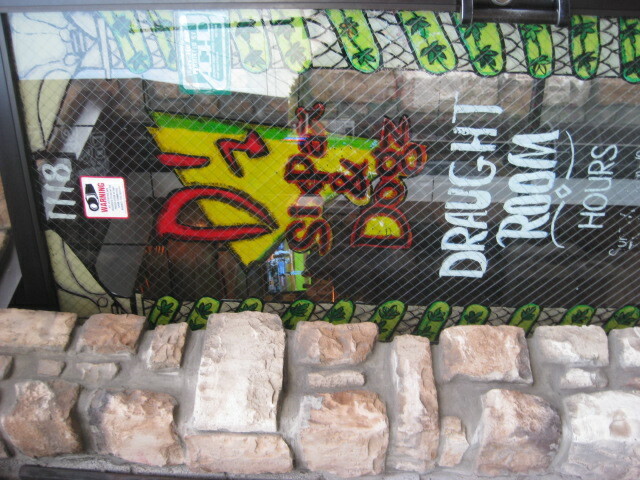 You go to D’s because you want to drink some beer and eat the right kind of food to go with that beer. True, there are many places like that in this ‘Burgh. 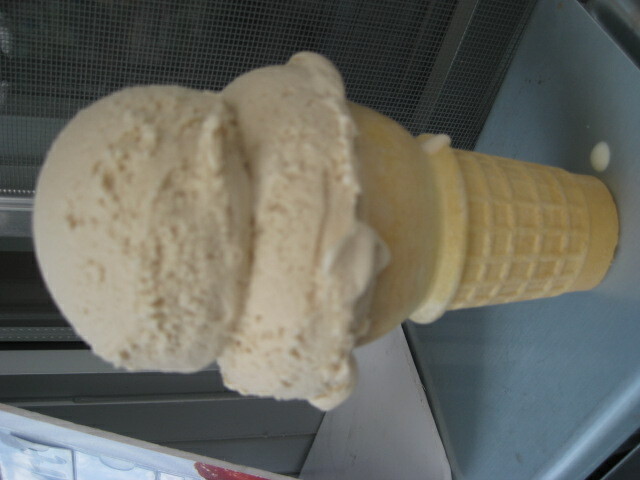 But D’s is undeniably one of the best. Some restaurants are like rock stars. Everyone talks about them. They’re in every magazine, every newspaper, on every blog. First people can’t wait to be the one who discovered them, and then people can’t wait to be the first to dismiss them as nothing special. They have their devotees, their die-hard fans on one end of the spectrum and on the other end, a whole host of critics with complaints justified and unjustified. Well, yes, Mom, they do. Sort of. Since opening in last fall, Salt of the Earth has steadfastly proven itself the new diva of the local dining scene, which is kind of funny, considering how aptly named it turned out to be. While the restaurant has high-end trappings – at least for this city – the general feel, pace, and atmosphere of the restaurant is casual. Let me put it this way: I was wearing an old dress, my dining companion was wearing cords. We saw people in business type dress, we saw people in jeans. Nobody flinched. Nobody stared. It didn’t seem to matter in the slightest. The main dining area of the restaurant is bordered by two opposing focal points: The large blackboard with the daily menu (the entire menu, including drinks, starters, entrees, and desserts, etc) on one side, the wide open kitchen on the other. The bar lines the far wall. There’s a smaller, more intimate setting upstairs and a few high-seater tables in the windows near the entrance, but the majority of the seating is exactly what my mother presumed, long tables lined by little benches. Oh, and of course, the counter seating that lines the open kitchen, which is exactly where me and my dining companion, Meghan, found ourselves when we visited this past Monday evening. When you’re not a hired food critic, you aren’t hampered in by silly notions of professionalism. A lot of people – not bloggers, usually, but people leaving comments and blurb restaurant reviews on sites like Yelp and Urbanspoon – take this as permission to be at their most short-sighted and dismissive. They’ll write off a place after one visit and go on and on about how it was the “worst service EVER” or the “worst burger EVER,” etc. And this sort of reviewer doesn’t even publicly admit when he or she was wrong about a place or has new opinions after a revisit. Those reviews stick far longer than the opinions themselves, and few people offer noted retractions. While I tend to view that practice with the utmost contempt, I am not above being unprofessional in my practices. I just tend to go the other direction – When my guard is down, I tend to be overly positive about a place. And how does my guard go down? Easily. Maybe it’s nice weather or the company of someone I haven’t gotten to see recently. Maybe it’s a good glass of wine or a nice, crisp gin & tonic. 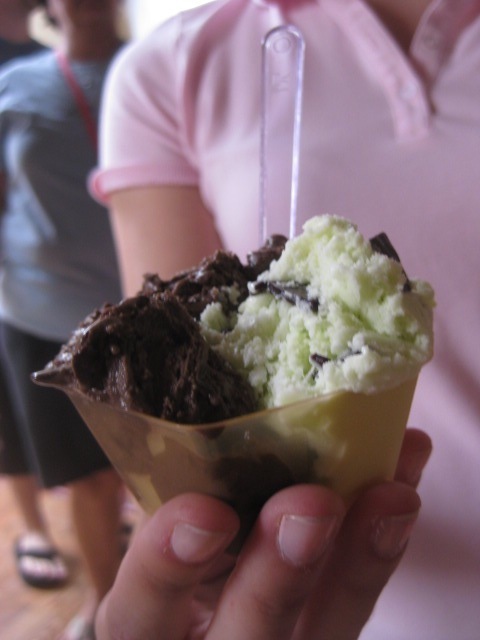 Maybe the service is particularly friendly or the food is comforting and tasty. Maybe it’s conversation, maybe it’s a Friday night and we’re all so relieved to have two free and open days in front of us. Or maybe it’s a boat on fire. That’s right. 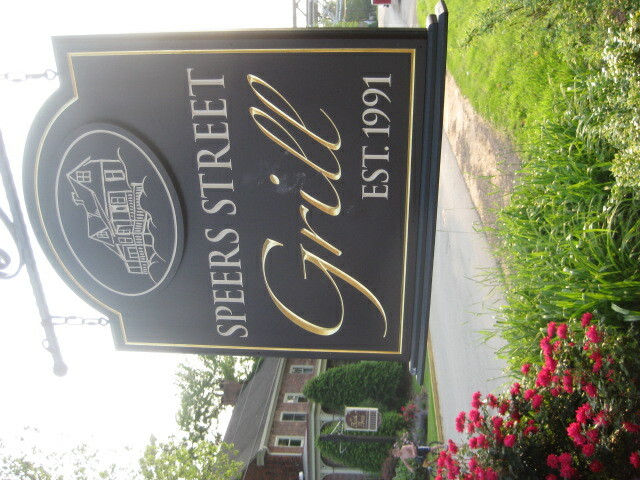 On the Sunday evening that I dined at the Speers Street Grill with my mother, we braved the mugginess on the outdoor patio seating and were rewarded with a generous helping of action and intrigue. Well, not really. Apparently, a boat had caught fire up the river. 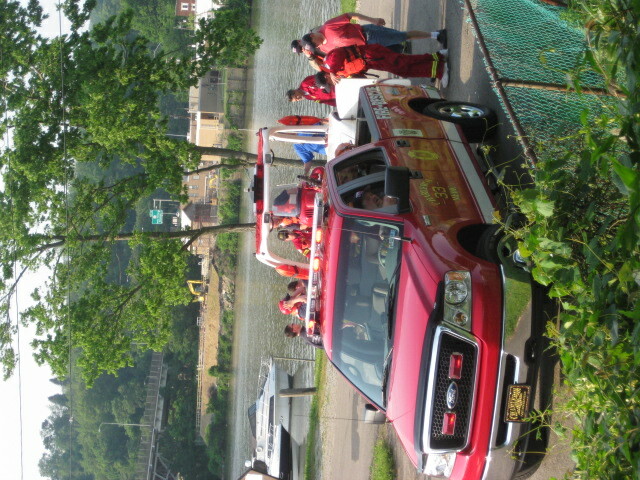 The back porch of the restaurant overlooks a common place to put boats in the river, so we got to watch a lot of slow-moving action centered around an emergency vehicle and the emergency rescue boat sent to retrieve those in peril. But, needless to say, our attention was not purely focused on the food in front of us. But if lack of professionalism leads to a positive review, so be it. We had a perfectly pleasant evening in Lower Speers, and I can only assume that were the food less tasty, was the service less friendly, was the overall atmosphere of the restaurant less relaxing, the meal would have been far less enjoyable.